This year has been an unusual one for white shark activity as far as their appearance in coastal ocean areas visited by humans. 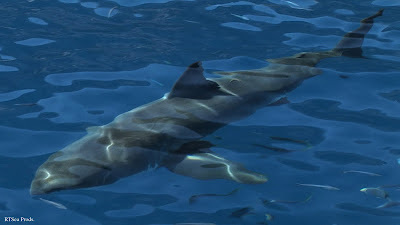 There have been reports of white sharks with greater frequency along the California coast and the northeast, off Massachusetts. And then there are the five fatalities that have occurred this year in Western Australia. It is too soon to make the assumption that white shark populations have grown significantly since conservation measures have been put in place for both the United States and Australia. That would take several years of reporting to establish a definitive trend. Are there changes in the white shark's primary food source that might bring them into greater contact with humans? Are there more people entering the water, thereby increasing the odds of an encounter? Or is it all just a statistical anomaly and next year we will all be wondering whatever became of the great white shark? It's just all too early to tell, but in an event like this, emotions can begin to run high and the demand for some kind of demonstrative, curative action mounts. The Western Australia Fishing Minister, Norman Moore, is feeling pressure from some segments of the public and is looking into whether he would be justified in declaring, at least temporarily, a suspension of Australia's regulations against catching white sharks. The thought is that a culling of sharks in local waters will solve the problem. Typically, when such actions have been initiated, they produce a much greater loss of shark species than is in any way reasonable. Often, all sharks, whether dangerous or directly implicated, become targets. In today's online CNN Opinion section, there is a calm, well-reasoned commentary as to why Western Australia should not resort to a knee-jerk reaction in response to the unfortunate events that have occurred this year. It is a particularly noteworthy opinion as it comes from Mike Coots, a surfer who lost a leg to an encounter with a tiger shark in Hawaii. I prefer not to editorialize Mike's rational argument in this post, so take a moment and read what he has to say from his very unique perspective. Click here. Thanks, Mike. I hope the good people of Western Australia can see things in the same light as you do.